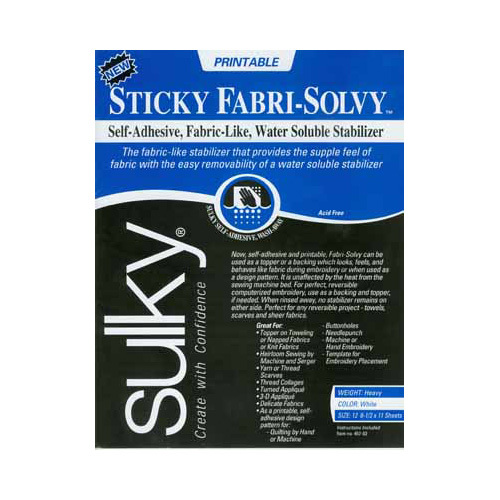 Sticky Fabri-Solvy works just the same as Fabri-Solvy only it has a wonderful self-stick back, which is accessed by removing a release sheet. It’s like magic for turned appliqués: stitch it, turn it, and stick it. It holds items in place for hoopless and reversible embroidery. Ideal for accurate placement of loose items when making scarves or thread collages. Photocopy or print designs onto it, then peel off the release sheet and stick the design in place for hand embroidery, appliqué, needlepunch, machine and hand quilting. With no paper component, it washes away quickly and completely every time! For photocopying and printing convenience, it also comes in 81/2” x 11” sheets.